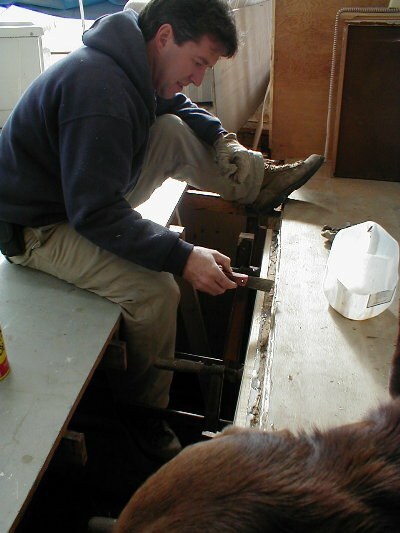 January 5, 2001 This week’s update tour will be led by Casey, WebBoat Dogteam Leader and Lunch Specialist. 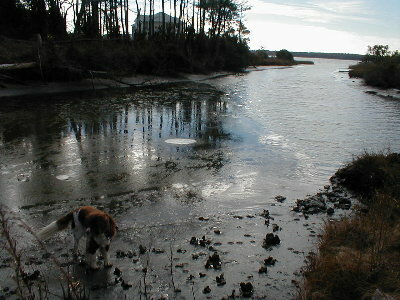 Casey would first like to stress that the weather has been so cold, a dog thinks twice about chasing a stick thrown on the icy creek. 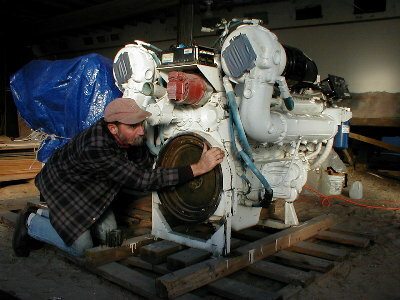 He’s happy to report that the WebBoat facility is not only fully encased in plastic (complete with special dog doors), but now houses three heating units – two woodstoves and one oil burner fed by diesel fuel recycled from Cherokee. The plastic allows for warmth, yet does not muffle the sound of Leonard’s lunch bell, a highlight of Casey’s work day. This has been a very productive week, even in dog standards. Bryan ordered new port lights for the entire boat from New Found Metals of Port Townsend, Washington. The marine propulsion department has made headway with the drive train, now trying to interface these components from three different countries – Finland, Germany, and the USA. The FF Waterjets are made by Kamewa, a Finnish company owned by Rolls Royce. The Centa centrifugal clutches, manufactured in Germany (basically two big go-cart clutches), engage when the RPMs of the engine centrifugally throw counterweights out that depress the clutch plates (this is a little over Casey’s head). Finally, the V892 diesels were built, aptly enough, in the Motor City – Detroit. 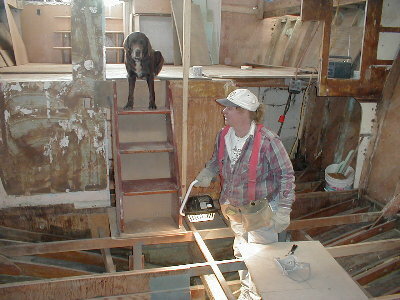 John Stein, under constant dog supervision, continues work on the side deck, port aft. He is in the process of gluing in one of the two new layers of sheer clamp. 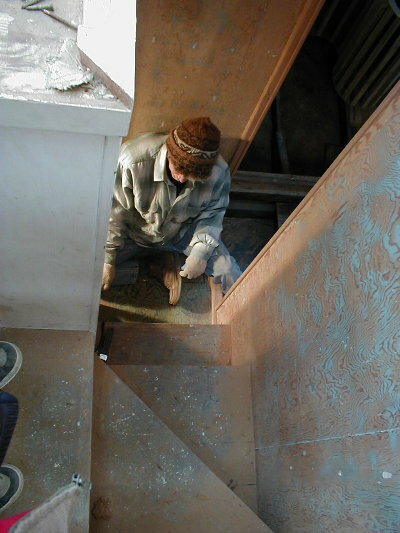 Frame ends and some of the stairwell area will also be replaced. 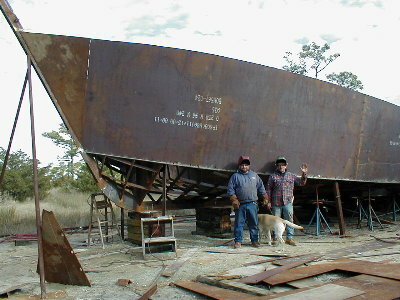 Jeff, Tom, Leonard, and Bill Davis have completed the bottom. 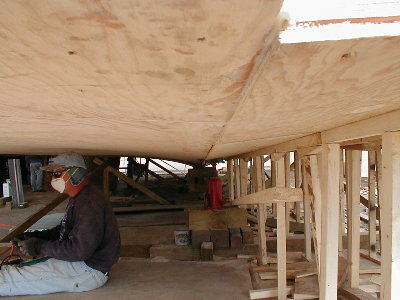 These pictures show the completion of all three layers of plywood on the starboard side, and the fitting of the last layer on the port side. The bottom crew finished at precisely one half hour after knock-off time on Friday afternoon, and then couldn’t tear themselves away from admiring their work and discussing the week to come. Was it dedication or quittin’ time beer that kept them hanging around? Probably a healthy combination of both. 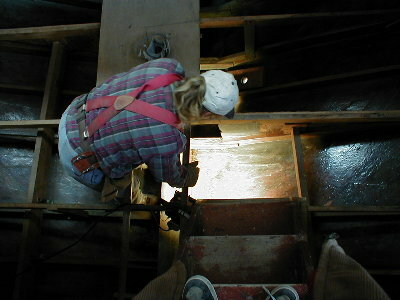 Robbin, after her final vacuuming of the bilge in the forward stateroom, discovered several areas of loose epoxy applied in years past. She chipped these away so the wood could dry. 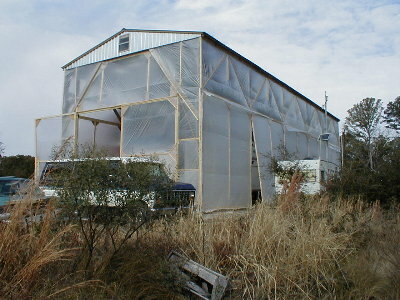 She also discovered several loose frames which will be fastened from the outside. The moral to this story is every canine’s motto: the more you dig, the more you find. 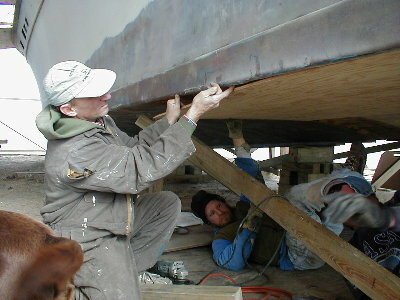 Epoxying of interior hull should begin this week, weather permitting.